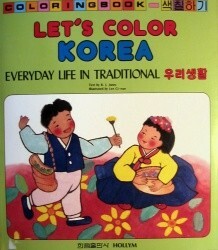 Produktinformationen "Let`s Color Korea: Everyday Life"
This book portrays some of the customs stemming from Korea's rich past. We hope that children everywhere will enjoy catching a glimpse of the ancient lifestyle and beautiful customs of the people of Korea. Weiterführende Links zu "Let`s Color Korea: Everyday Life"
Unser Kommentar zu "Let`s Color Korea: Everyday Life"
Kundenbewertungen für "Let`s Color Korea: Everyday Life"